In this popping dance video mini-series you will learn the most essential moves and techniques you need to get started with. Pop and lock dance style is characterized by quickly contracting and relaxing various muscle groups to create a very sharp movement. Below you will learn forearms hits/popping, chest pop, and Dubstep dance basics. Please check out the full course if you want to learn more moves. 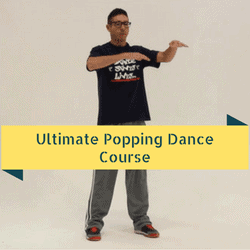 In this second pop and lock dance lesson you will learn how to do a chest pop. The chest pop is really cool because it can create such a big effect in your popping. You will learn the technique needed to do a chest pop and also get drills to practice it. Dubstep dance is actually popping dancing to dubstep music! In this lesson you will learn how to incorporate “dime stops” and “hits” when you dance to dubstep dance music. The instructor also gives you specific pattern to follow your moves, but at the end you can play with it to make it your own.